We are highly experienced in the design of sustainable buildings, from community projects and housing to offices, incorporating innovative building techniques, low toxin materials and low carbon technologies into our designs. We draw on our wide knowledge of innovative approaches to enhance our projects. Director Paul Barham has RIAS Accreditation in Sustainable Building Design and is a past-Chair of the Scottish Ecological Design Association (SEDA). We are experienced urban designers, working with communities and stakeholders to prepare proposals that will promote sustainable communities; places where people want to live, work and make their homes. We have extensive expertise in working with client groups, stakeholders, residents and wider communities. We use techniques such as online questionnaires, face-to-face interviews, design charettes, public meetings, workshops and design reviews to obtain comment and feedback on our design ideas, to ensure that our projects deliver sustainable assets for the community. We have extensive experience of working with building owners and residents to give new life to old buildings, ranging from planned maintenance to comprehensive improvements, building conversions, refurbishments and renovations. Director Paul Barham has RIAS Accreditation in Conservation Architecture. Director Paul Barham is a BREEAM registered Ecohomes Assessor. We offer advice on energy efficiency and achieving this standard as well as carrying out assessments to achieve certification. We use this expertise to influence our own designs as well as advising other professionals. Director Alison Glen is a registered Access Consultant with the National Register of Access Consultants (NRAC). This expertise influences our own projects, assisting us in the design of accessible buildings and environments, as well as providing a service to other clients and consultants. We have worked with suppliers to carry out specialist research and product development. 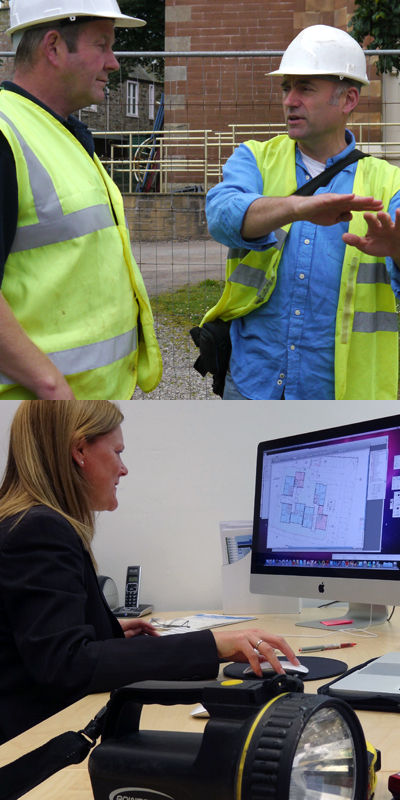 Paul Barham is a past-Chair of SEDA, involved in the development of innovative and sustainable building materials and construction methods and Alison Glen has recently completed a pilot project for off-site manufacture and has extensive knowledge of innovative building approaches.